In this simulation the code for the three above mentioned algorithms is demonstrated, as applied to the numerical solution of an explicit, linear ordinary differential equation of first order. Starting from an initial value, a series of consecutive points is calculated and shown in a graphic. For this special function the differential equation does not explicitly depend on the variable t, which allows a simple graphical interpretation of the approach. When opening the file the abscissa range is divided into 5 intervals. The number of intervals can be chosen between 1 and 24 by means of a slider; the interval widths change correspondingly. The default initial value for x = 0 is y0 = 1 . It can be changed with a second slider. The analytic solution curve (blue) changes with y0 . Each change starts a new calculation of the numerical approximations for the three methods. The discrete points calculated with Euler are drawn blue, those with Heun in green, those with Runge_Kutta (4 step) in red. Back resets the number of intervals and initial value. A second window shows the relative residual difference between the numerical approximations and the analytic solution. Coordinate scales adjust themselves to the mistake of the Euler approach, for which it is largest. When you open this file from the EJS console you can easily insert other differential equations instead of the very simple one of the exponential. The corresponding places are highlighted in the code pages. Just a few lines of code are sufficient for the numeric algorithms. They are applied in a loop as often as there are intervals. The end value of one loop is the initial value for the next one. F[i] are deviations of the numerical results from the analytic ones. You will find this code in the EJS console at page Initialization. lines marked // include remarks that do not influence the calculation. E 1: Choose the number of intervals as n = 5. Visually compare the quality of the three numerical approximations. Use the right window with its zoomed scale for that purpose, too. E 2: Change the number of intervals n and compare qualitatively how the three approximations approach the analytic solution. E 3: Make notes of the relative mistakes of the three methods with increasing n and draw a graph of their dependences. Compare this graph with a straight line for Euler and with a second grade parabola for Heun (with Runge−Kutta the deviations will be too small to clearly recognize the graph as a fourth grade parabola). E 4: Open the file from the EJS console and study the code at page Initialization. Use other derivatives to solve different differential equations (for the exponential the derivative was simply y). The correct places are marked in red. This simple simulation helps to visualize the different numerical methods of solving differential equations. 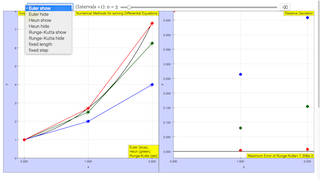 The three methods that this simulation provides are the Euler method, the Heun method (otherwise known as the Improved Euler method), and the Runge-Kutta method (specifically RK4). Each numerical method of solving the differential equation y' = y is color-coded as shown on both graphs. The number of intervals (steps) can be adjusted with the slider at the top, going up to n = 25. The button at the top right resets the simulation. As the number of intervals increase, note how the approximations become more accurate to the original curve.